Russian President Vladimir Putin spent several hours fielding questions from various citizens and experts in his annual live TV call-in show on April 18. Though many of the questions concerned the Ukrainian crisis, former NSA agent Edward Snowden asked a question about the extent of state surveillance in Russia. Though the lion’s share of the questions centered on the country’s relations with Ukraine, a question about the probability of the government spying on the citizens of the Russian Federation was asked by former CIA officer Edward Snowden. A video question was sent to the Russian leader from the former U.S. intelligence agent Edward Snowden, who was given temporary asylum in Russia after exposing the U.S. government’s across-the-board surveillance of its citizens. Snowden was interested in whether the Russian Federation also carries out such surveillance. Responding to the American’s question, Putin said that mass surveillance of the population, as it is done in the U.S., is impossible in Russia. He pointed out that the use of special equipment by Russian special services, including wiretaps and surveillance on the internet, is strictly regulated by law. In particular, it is necessary to first obtain a relevant court order. “[On] such a massive scale, an uncontrolled scale, we certainly do not allow [this]. And I hope we will never allow [this],” assured the Russian leader. He added that Alaska had been sold in the 19th century. “Russia is a northern country, with 70 percent of its territory belonging to the north and the far north,” he said, noting that supporting such regions is difficult on the state budget. Putin has admitted that the level of trust between Moscow and Washington has dropped significantly recently. "I agree that trust has largely been lost. But why is this happening? We believe there is no fault of ours here." "To act the way the United States does in Yugoslavia, in Iraq, in Afghanistan, in Libya, they are allowed to do so. So why isn't Russia allowed to defend its own interests?" said Putin. Putin believes that the bloc system has become obsolete, explaining that NATO was created in opposition to the Soviet Union. Pointing out that the Soviet Union has ceased to exist, yet NATO remains, the Russian leader wondered whom the activities of the alliance are now directed against, and why NATO is expanding its presence closer to Russia’s borders. “Russian-Chinese relations will be a significant factor in world politics and will significantly influence the modern architecture of international relations,” said Putin. Putin said main revenues in budget come from oil, not gas. "Last year, revenues from oil were $191-$194 billion; revenues from gas - around $28 billion. Do you feel the difference?" The drop in oil prices from $90 to $85 per barrel is not critical for the Russian economy, said Putin. Putin restated his claim that there was an unconstitutional coup and armed seizure of power in Ukraine. The Russian leader categorically denied all accusations of Russian troops taking part in the events currently occurring in eastern Ukraine. Putin considers it extremely important that an early dialogue be started between the current Ukrainian authorities and the regions of the country. He stressed that Russia has always been close to Ukraine, saying that financial aid provided to the country has already reached hundreds of billions of dollars. As for the issue of Crimea and Sevastopol, according to the president, this was clearly decided by the outcome of the referendum on the peninsula. Russia never planned to take any military action in Crimea and was ready to build relationships in the current geopolitical circumstances, but was forced to act as result of “real threats” to the Russian-speaking population. “The threats against Russians and Russian-speakers were concrete and tangible. This prompted the people to think about the future of Crimea, and turn to Russia for help,” said Putin. Putin reiterated that Russia considers the currently established government in Ukraine to be illegitimate. Despite this, however, the Russian side is not refraining from engaging in dialogue, he claimed. 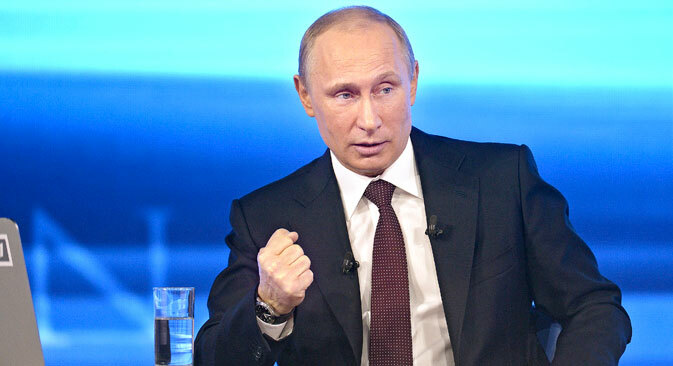 Putin declared himself ready to work with all parties in the elections in Ukraine. The Russian president hopes that he will not have to send troops into Ukraine. The Russian parliament has given the leader this permission. “I really hope that I do not have to exercise this right, and that political and diplomatic means will be able to solve all the sharp, if not the most acute problems of the day, in Ukraine,” said Putin.